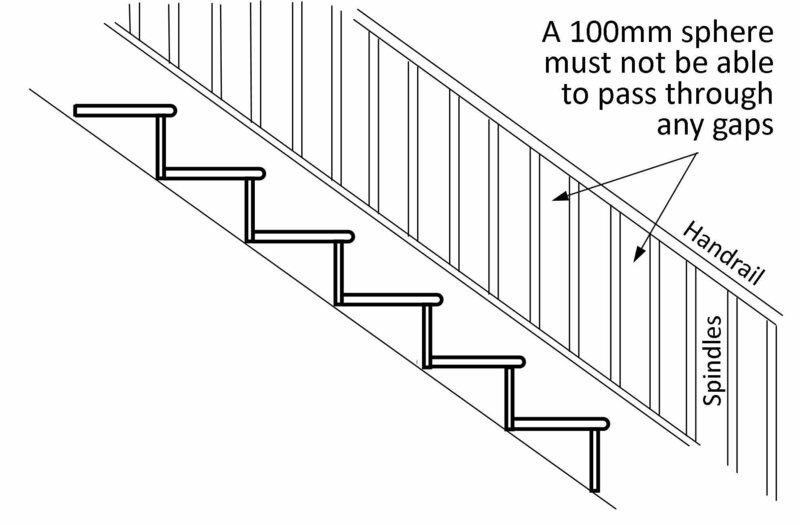 This page will provide you with a basic guide to current stair and staircase regulation in the UK for residential and commercial properties. You should always ensure any structural additions to your property meets all the current regulation for safety and to avoid having to make costly changes later in your project. If in doubt over any regulations you should always consult a building inspector. 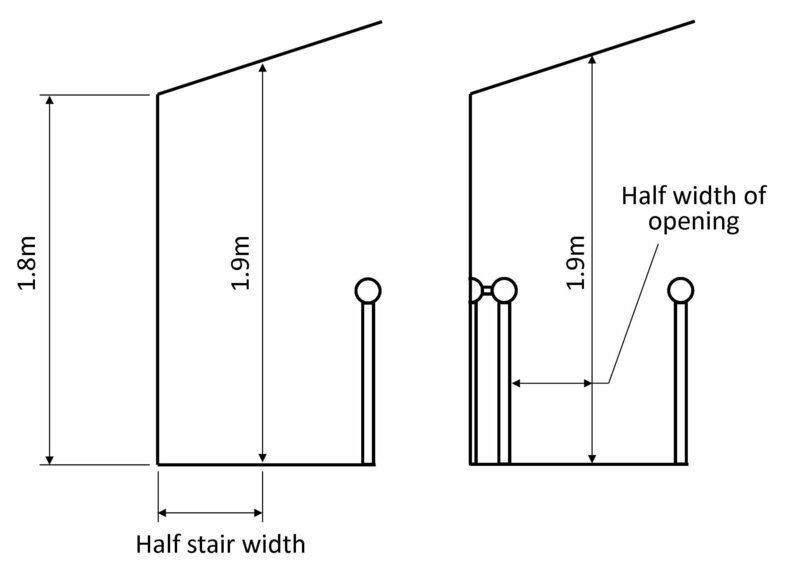 Information provided here covers staircase regulations for dimensions and steepness, stair construction, headroom space required, winders and landings on stairs, handrail specifications and more. Pears Stairs are able to assist you with any staircase regulation questions you have, please don't hesitate to contact us. Phone Pear Stairs on 01938 553311. Why not use our 3D staircase creator to build your staircase and we will check building regulation for you? To assist you with your design ideas, budget calculation and any regulations, why not use our simple step-by-step 3D Stair Creator tool, and our team of designers will provide accurate drawings and costings, and of course advice upon receipt of your concept design. We ensure our designs meet building regulations. The staircase building regulations consider three categories. Private Staircase- for a domestic property. Utility - are for serving a place where a substantial number of people will gather. (Public Staircase). General Access- are defined as offices, disabled, factories and common stairs serving more than one dwelling. (Semi-Public Staircase). Building regulations stipulate that staircase steps should all be level. In a private dwelling, regulations require a nosing overlap of at least 16mm. 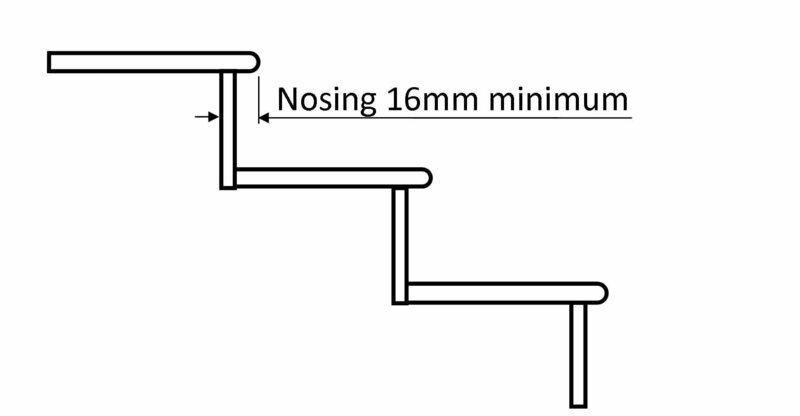 Nosings of steps should be at least 16mm. 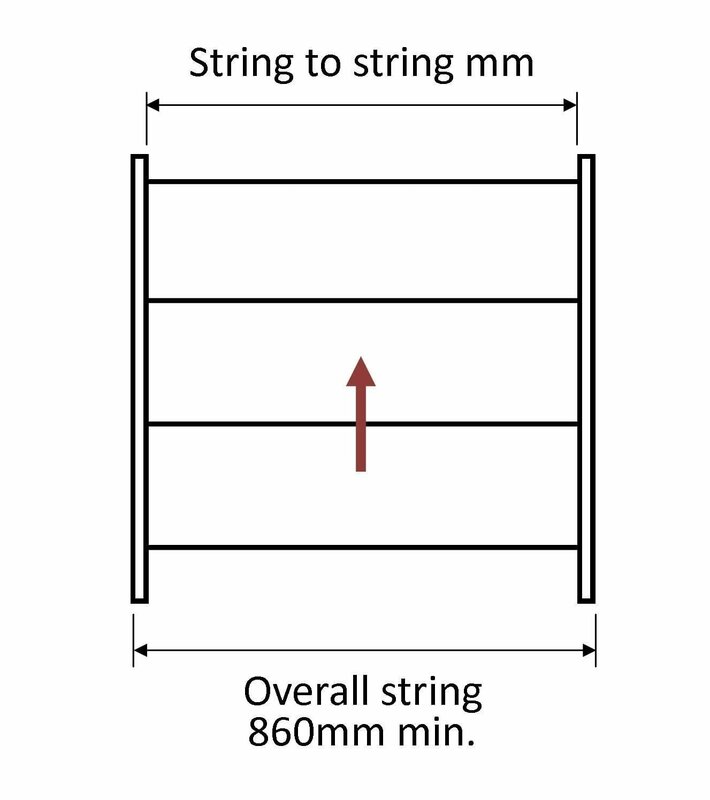 Without a 16mm overhang, it would make the overall going on the staircase very long to accommodate at least a 220mm tread. Building inspectors are now asking for no nosings on staircases for offices, flats or other public stairs. 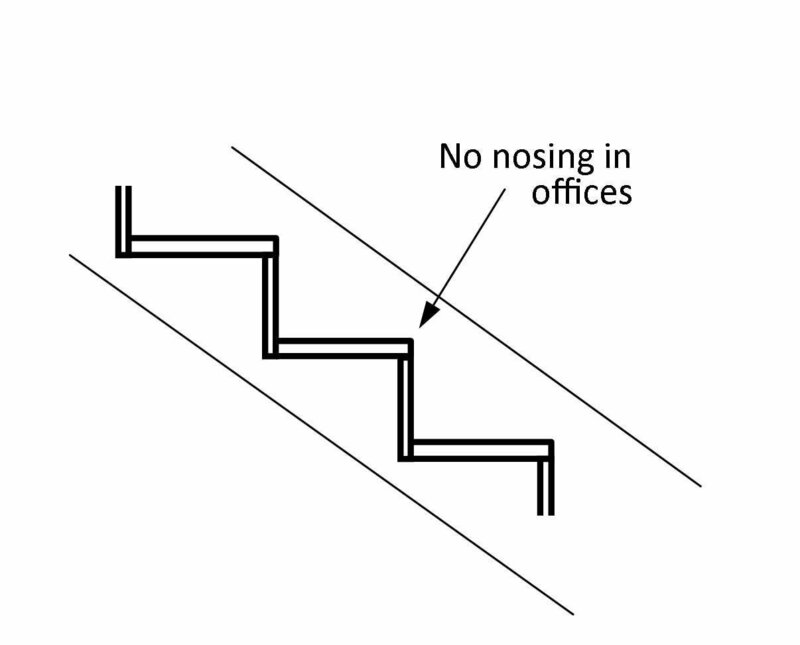 Flush nosings should be used on public stairs when a passenger lift is not provided.This is to eliminate the trip hazard of standard nosings that overhang the risers. The rise should be between 150mm and 170mm and going between 250mm and 450mm. Some building inspectors are avoiding any steps into a building and are insisting on ramps. Please check with building inspector for your individual requirements. ALL steps must have the same rise. You cannot have, for example, have 200mm for the first three risers and 205mm for the remainder. However, if there is a flat landing between a staircase it can be interpreted that you can have a different rise and going on the bottom flight to the top. Pear Stairs do not recommend this practice. It is not considered excellent practice. Rises that are not exactly the same height are a serious fall risk. Private Staircase (Domestic) Max Rise = 220mm, min going 220mm. Utility (Public) Max Rise = 190mm, min going 250mm. General Access (Semi-Public) Max Rise =170mm, min going 250mm. 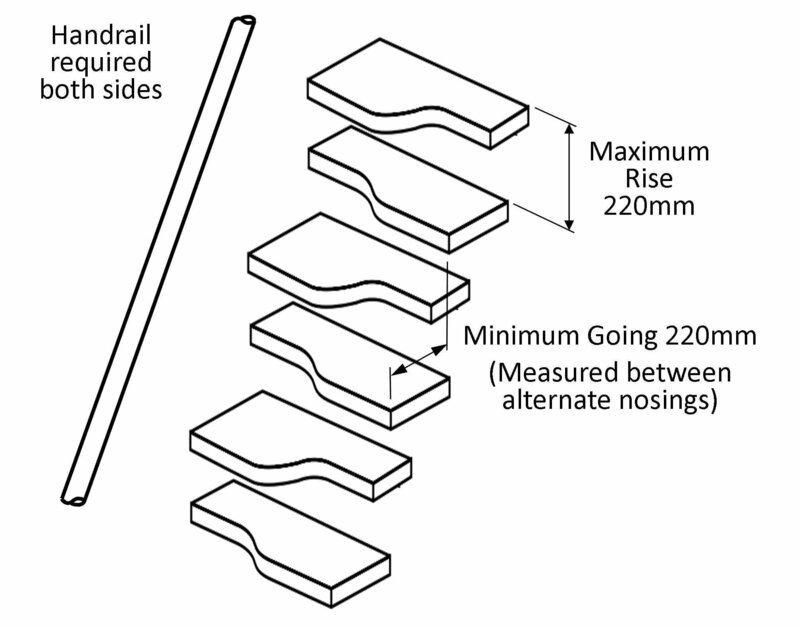 Please Note - that your stair tread cannot be too long or the riser too short because building regulations also state: Twice the rise plus the going (2R+G) should be between 550mm and 700mm. Private Staircase(Domestic) = 42° Maximum. Utility (Public) = 38° Maximum. General Access (Semi Public) = 33° Maximum. There are no recommendations as to the minimum width of a staircase - Yes Really! There are rules for direct fire escapes and disabled access and you will have to consult Part M of the building regulations Building Regulations Part M and talk to your building control officer who can interpret these rules differently. However, Pear Stairs recommend: To make a staircase visually pleasing and comfortable we would recommend that you don’t try to have a staircase narrower than 860mm overall string. 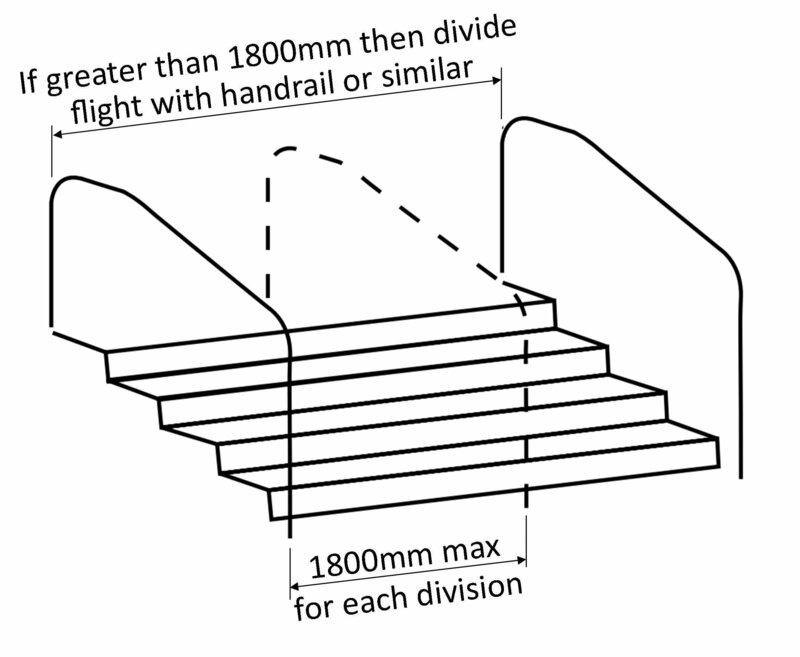 The maximum width of a public staircase is 1800mm. To overcome this you can simply add an extra handrail, newel and spindles to divide the staircase. 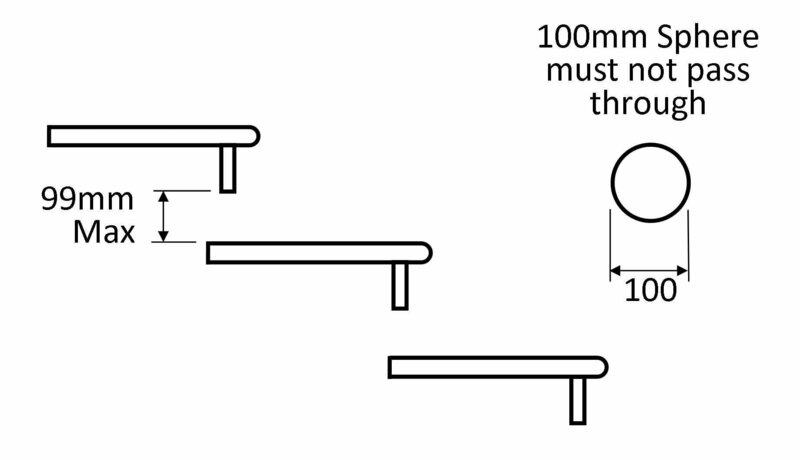 Please note: If stairs are more than 1000mm wide you must have a handrail on both sides. For domestic properties, there are no restrictions as to the length of a flight up to 36 risers. Above 36 risers there should be a change of direction of at least 30°. For public buildings for assembly purposes then the number of risers are restricted to 16. 1. Landings must be provided at the top and bottom of every flight of stairs. 2. 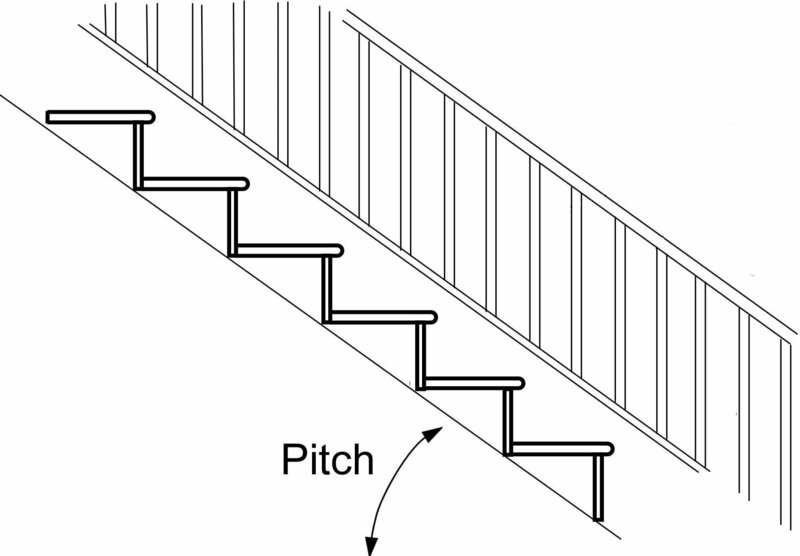 The landing distance in front of the top and bottom step must be wider than the width of the staircase. 3. No door should swing closer than 400mm onto the front of any step. 4. 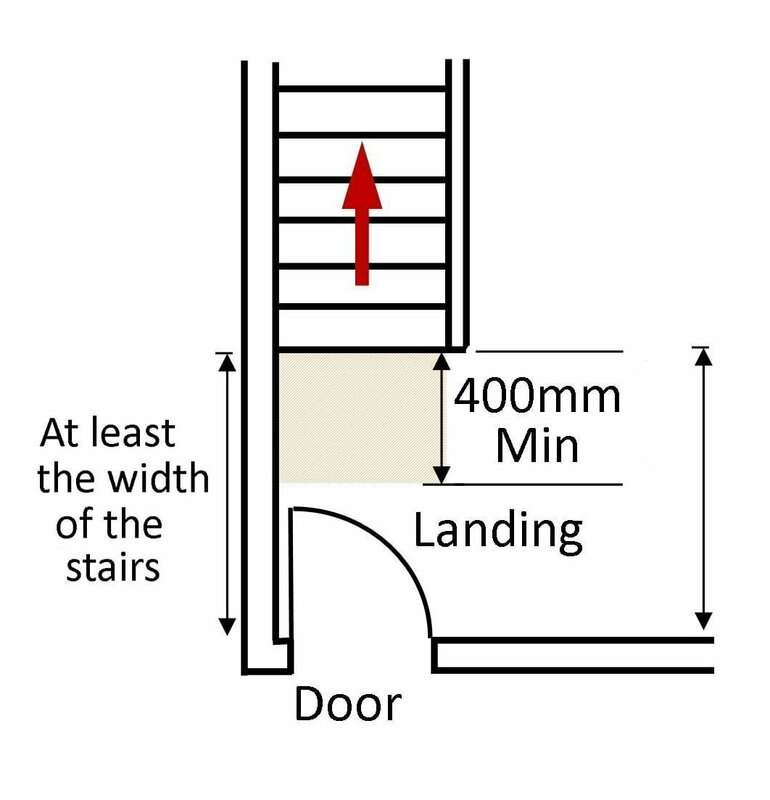 All landings should be level other than the ground floor level which can have a gradient but not exceeding 1:20. 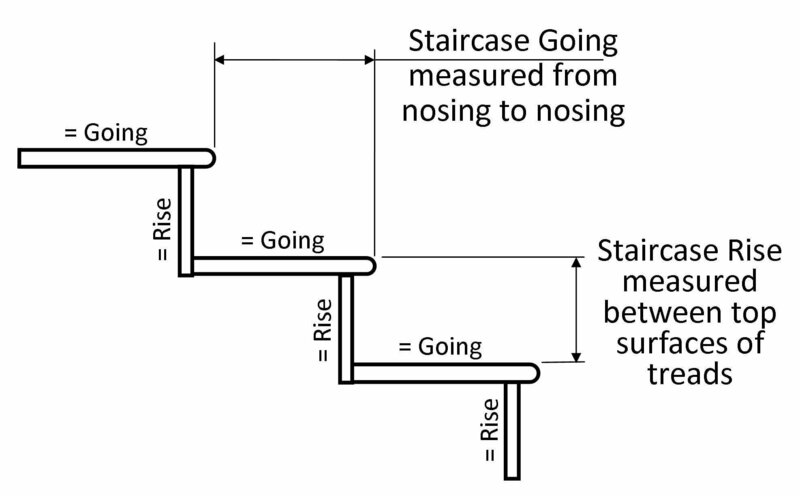 For most staircases, the building regulations require the centre of the staircase dimension “A” above must be equal length and also be the same or bigger than the dimension as the going on the straight flight of the staircase “B”. If the staircase is wider than 1000mm then seek Pear Stairs help. Stairs should have a handrail on at least one side if they are less than 1m wide. They should have a handrail on both sides if they are wider than 1m. You do not need a handrail on the first two steps up. 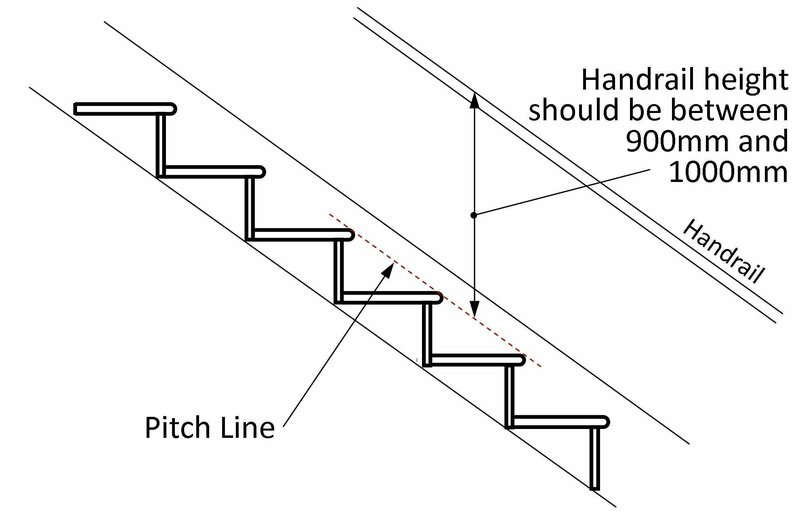 In all the buildings handrail height should be between 900mm and 1000mm measured to the top of the handrail to the pitch line. A 100mm sphere cannot pass through any openings between spindles or any other gaps in the handrail, such as between glass panels. The aim is that a small child's head should not be able to fit through any gaps on the balustrade. Staircase Building Regulations are covered by further regulations parts M1 and M2. 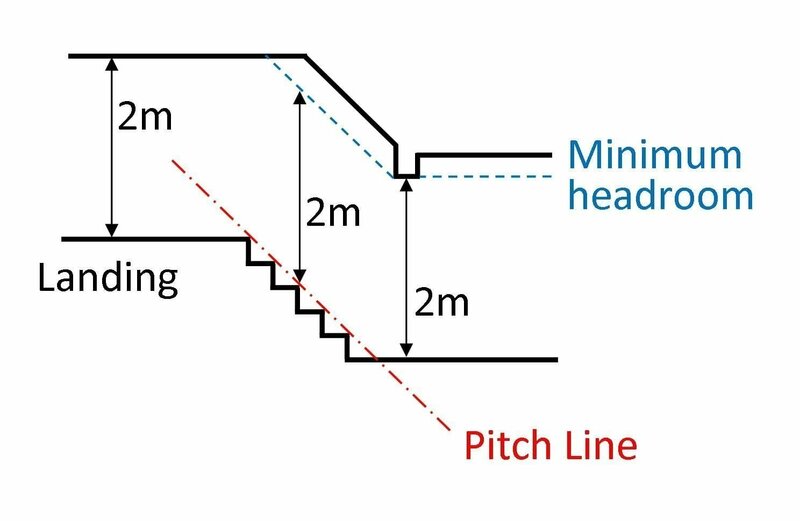 A headroom of at least 2m is required at all points on and off a staircase and as you pass down a staircase. 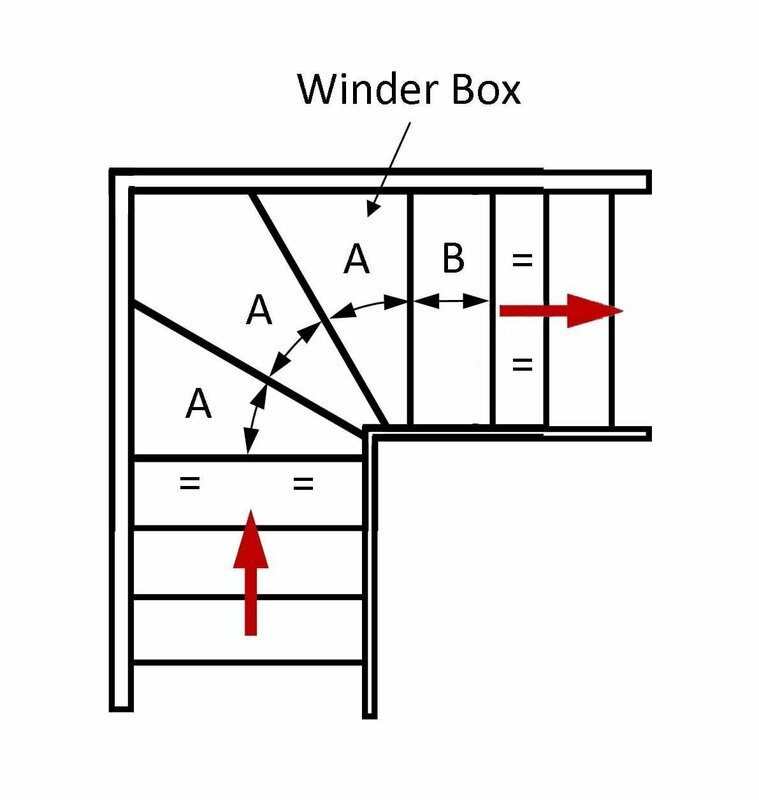 For loft conversions, the headroom will pass the building regulations if the centre of the stair width is 1.9m reducing to 1.8m at the side of the stair. Please Note - Where there are real difficulties in the height some building control officers will allow you to build a newel out from the wall to meet the regulations. This does make the staircase narrower but this may be the only option. All stairs which have open risers should be constructed so that a 100mm sphere cannot pass through. This regulation has been stipulated by the government in order that children’s heads cannot get stuck in any opening. For public stairs, regulations are currently asking for no open risers. 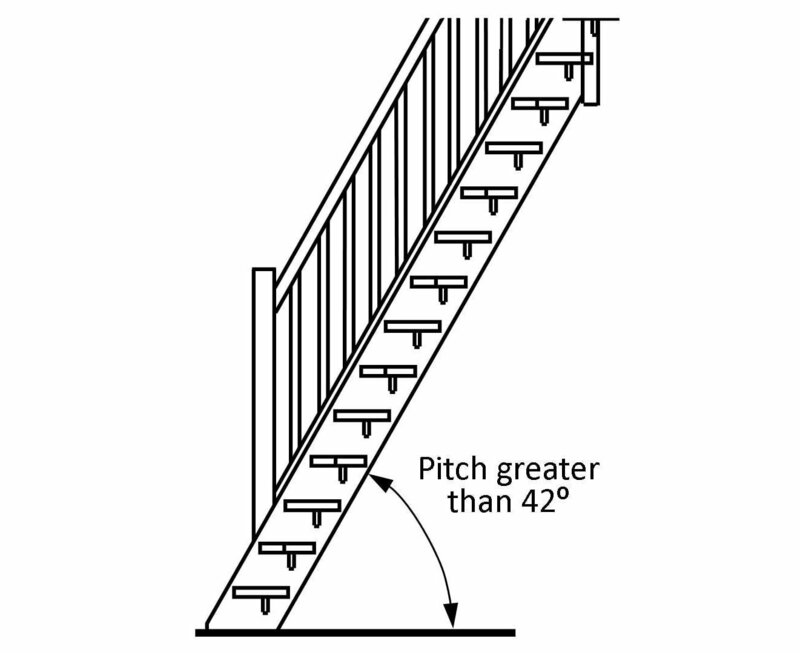 These are staircases that break the rule of “a maximum pitch of 42°”, and are generally used when space is limited. The use of these staircases are quite often interpreted differently by different building Inspectors, they do not like their use. The building regulation rules state that they can be used to a single room only if there is no other alternative. The maximum rise for space saving stairs is 220mm and the minimum going is 220mm. You should fit a handrail to both sides of spacesaver stairs. Pears Stairs are able to assist you with any staircase regulation questions you have, please don't hesitate to contact us, we are a very friendly company. Phone Pear Stairs on 01938 553311. We also sell high-quality oak doors through one of our other group websites. We offer a huge selection at great prices. Why not refurbish your doors and stairs!